Nearly four years ago, a car accident at the covered bridge forced the closure of one pedestrian pathway for a few months. 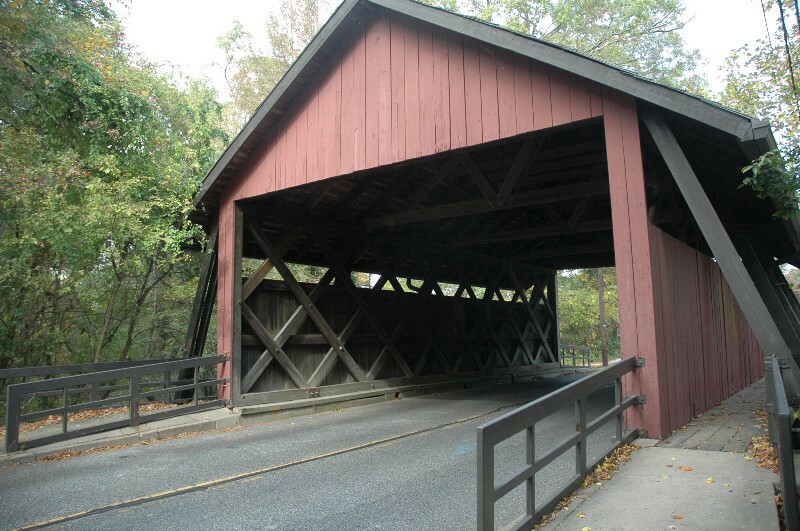 Cherry Hill Township residents received a major traffic headache earlier this week when a truck got stuck under the historic Scarborough Covered Bridge. The truck was removed, but caused enough damage to close the bridge for two days. The bridge re-opened to vehicular traffic on Wednesday. Monday’s accident wasn’t the first time repairs have needed to be done to the bridge. Nearly four years ago, another traffic accident required repairs to be made to the bridge. The Cherry Hill Sun’s coverage of Cherry Hill Township Council’s June 24, 2013 meeting includes a note about an accident at the Scarborough Covered Bridge on May 26 of that year. In the story, former Sun editor Shannon Caulfield notes council passed a resolution authorizing repairs to the bridge. Township communications director Bridget Palmer said an accident had caused damage to the pedestrian walkway on the east side of the bridge. The repairs were funded partially under reserve property and liability insurance. The driver’s insurance company also provided up to $50,000 to fund the repairs. Unlike Monday’s accident, the bridge was able to remain open to vehicular traffic in 2013 while repairs were completed on the pedestrian walkway. Repairs were finally made on the bridge in September of that year. The Sun’s archives include one other instance where repairs were made to the Scarborough Covered Bridge. In 2009, the township completed the first phase of reconstruction for Covered Bridge Road. Part of the first phase included repairs to the historic bridge. Former editor Robert Linnehan reported a number of boards on the bridge had been damaged and were replaced. In addition, the township’s department of public works completed infrastructure repairs underneath the bridge. Do you recall any other accidents at the Scarborough Covered Bridge? Tell us in the comments or email news@cherryhillsun.com.